Today is a recipe for a healthy candy. A healthier one, anyway. 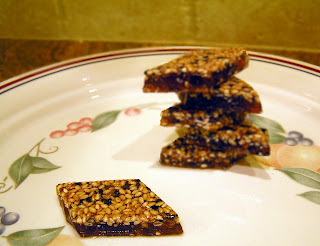 You might have seen honey-sesame bars in the natural or ethnic foods aisles. According to that middle-eastern repository of culinary knowledge, wikipedia, sesame seeds are high in vitamins and anti-oxidants. They can also help reduce blood cholesterol. Sesame candy also contains honey, containing trace amounts of essential nutrients. And lemon juice is just chock-full o'vitamin C. Wow! I feel healthier just thinking about eating this stuff! Although most of the sesame seed products in the supermarket are in the middle-eastern aisles, they are not just a middle-eastern food item. Versions of sesame candy are available all around the world wherever sesame plants grow. Greece has Pastelli. Israeli has Sukariyot Sumsum. Puerto Rico's has dulce de ajonjoli. And India has Til Burfi, among others. Although each country uses its own unique ingredients and spices, the basic recipe is still the same. 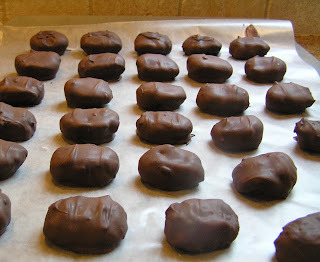 Here is one of the first candy-type chocolates I ever made, and also one of the easiest. 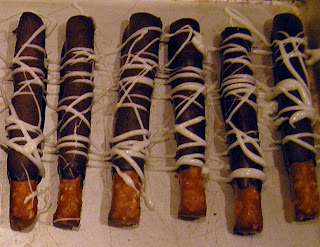 Since chocolate only needs heating not much past body temperature, it's a fun and safe treat to make with your kids. If you are serving right away, simply melt chocolate chips or even a chocolate bar.. Otherwise you need to mix in a little vegetable shortening to make them room temperature-friendly. I must admit that it took me many years to try this recipe. Chocolate and salt? Are you kidding? But it was a match made in New Jersey heaven! Salt cuts the sweetness of chocolate yet compliment each other. Chanukah is just around the corner. Luckily this year it falls later on in December (some years it hits mere days after Thanksgiving), which gives me a bit of time to start getting elbow-deep in chocolate. Um ... isn't Chanukah food traditionally of the fried persuasion? Well, Dear Reader, it usually is. But I don't have the energy or equipment to mass-produce the amount of fried treats necessary to supply theHubby's bestest clients. Plus fried foods taste much better fresh; cold or reheated sufganiyot (fried dough balls filled with jelly or some other sugary substance) just don't quite make it. Unless you are in college and it's 2am. So I instead get elbow-deep in chocolate and other sugary confections over the course of several weeks. Then lovingly place the candy in boxes and on trays, carefully wrapping everything in ribbons and tying on bows. Then theHubby hand-delivers it all and gets all the compliments. Joy of Kosher is sponsoring the Best of Kosher awards. And guess what, Dear Reader? I have been nominated in the kosher blog category. Woo-hoo! I am sooo honored! Please vote for me! Visit Joy of Kosher (you might have to scroll down) to cast your vote. First prize is a mention in the Joy of Kosher magazine and blog, as well as my own personal web badge to display proudly on this site! Is that awesome or what? Thankyouthankyouthankyou!